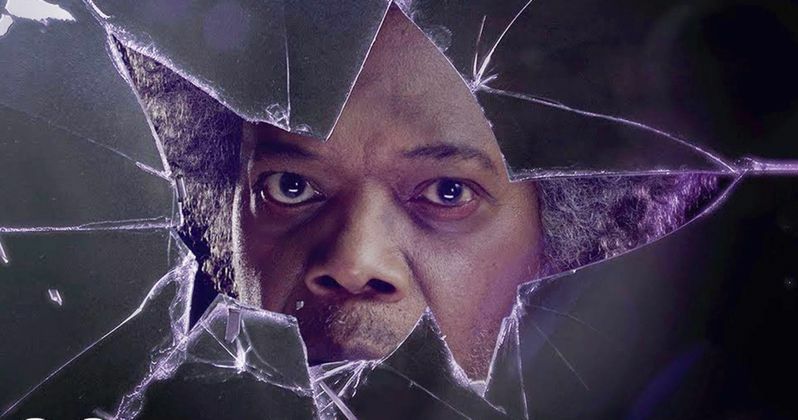 M. Night Shyamalan's Glass trailer is one of the most anticipated events at San Diego Comic-Con this year, and now we have the third and final teaser, which focuses on Samuel L. Jackson's Elijah Price, aka Mr. Glass. Yesterday, we saw the return of Bruce Willis' David Dunn from 2000's Unbreakable and the day before that was James McAvoy's The Beast from 2016's Split. Naturally, these teasers don't spoil anything about the upcoming sequel, but they do hype up the excitement for tomorrow's full-length trailer. Glass is M. Night Shyamalan's unprecedented sequel to both Unbreakable and Split. Bruce Willis returns from Unbreakable as David Dunn as does Samuel L. Jackson as Elijah Price, known also by his pseudonym Mr. Glass. Joining from Split are James McAvoy, reprising his role as Kevin Wendell Crumb and the multiple identities who reside within, and Anya Taylor-Joy as Casey Cooke, the only person who was able to survive an encounter with The Beast. It appears that the mysterious Mr. Glass holds the key to understanding both Dunn and The Beast. Glass will round out M. Night Shyamalan's trilogy and confirms that Unbreakable's Elijah Price and David Dunn exist in the same universe as Split's Kevin Wendell Crumb. That was already established at the end of Split when Bruce Willis' Dunn makes an appearance mumbling Elijah Price's name. Shyamalan fans were stunned by the reveal and the 2016 movie was hailed as an awesome return to form by the writer/director. That makes the first footage of Glass special, even if we know we still have quite a while to wait before the movie hits theaters. Defining who the villains in Glass are might not be as easy as one thinks. Elijah Price, Kevin Wendall Crumb, and David Dunn all have some mental issues going on that have influenced their behavior. Mental instability could prove to be what brings them all down in the end, which begs the question of who the real villains in the movie are. All three men are responsible for some pretty terrifying behavior, but could the medical professionals be to blame for everything? This is M. Night Shyamalan that we're talking about here, so nothing is really what it seems on the surface. Expect the unexpected when Glass hits theaters early next year. This riveting culmination of his worldwide blockbusters is produced by M. Night Shyamalan and Blumhouse Production's Jason Blum, who also produced the writer/director's previous two films for Universal. They produce again with Ashwin Rajan and Marc Bienstock, and Steven Schneider and Kevin Frakes, who executive produce. Gary Barber and Roger Birnbaum also serve as executive producers. Glass will open in theaters on January 18th, 2019 and while we wait for the movie to hit theaters, you can check out all three of the teaser trailer below, provided by the Universal Pictures YouTube account.